By Victoria A. Campbell, M.D., Michael D. Starsiak, M.D., Mickaila J. Johnston, M.D. A previously healthy 8-year-old boy presented to the emergency department after falling from monkey bars. He was unable to bear weight and was found to have a right proximal femur fracture extending through a mixed sclerotic and lytic lesion. The lesion was eccentric and demonstrated a thin sclerotic rim with no periosteal reaction (Figure 1A). Additional similar lesions were throughout the right femur. 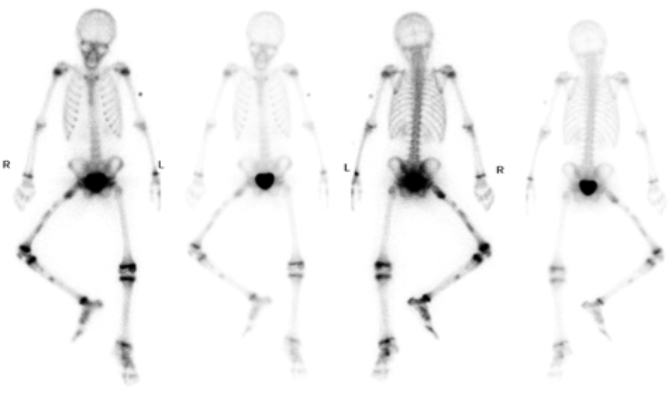 Tc99m MDP bone scintigraphy revealed additional lesions in the tibia and pelvis (Figure 1B). The radiographic appearance of fibrous dysplasia lesions may be protean and, hence, can appear in a differential diagnosis for lesions that may vary in appearance from lytic to densely sclerotic. Most commonly, fibrous dysplasia lesions initially demonstrate a purely lytic appearance and then develop a hazy or “ground glass” appearance as the matrix calcifies. Such lesions tend to occur centrally within bone, vs. being cortically based, and often have an expansile appearance. Fibrous dysplasia may present in monostotic (80% to 85%) or polyostotic (15% to 20%) patterns. Bone scan is useful for evaluating polyostotic disease since the lesions usually demonstrate increased activity. Uptake in a lesion that is out of proportion to other lesions in polyostotic fibrous dysplasia can indicate a complication, such as pathologic fracture or a synchronous lesion of a different etiology, such as infection or malignancy. When polyostotic, fibrous dysplasia lesions are often unilateral, most commonly found in the femur, tibia and pelvis.2 Several syndromes are associated with polyostotic fibrous dysplasia. McCune-Albright syndrome includes the triad of polyostotic fibrous dysplasia, precocious puberty and café-au-lait spots (coast of Maine). Mazabraud syndrome is defined by polyostotic fibrous dysplasia and multiple soft tissue myxomas. Clinically, fibrous dysplasia lesions are not painful unless complicated by pathologic fracture. LCH, like fibrous dysplasia, often presents radiographically in a protean manner. Lesions may be lytic or sclerotic and may have well-defined sclerotic margins vs. ill-defined borders. Unlike fibrous dysplasia or NOF, however, LCH lesions may have a periosteal reaction and exhibit a more aggressive appearance.5 A bony sequestrum may be associated with this lesion. LCH lesions may or may not be associated with pain and are encountered nearly exclusively in the pediatric and young adult population.5 LCH is most commonly monostotic, but may be polyostotic. Bone scan is useful for identifying polyostotic disease, although it needs to be used in conjunction with radiography as uptake is variable depending on histology, and the modalities have overlapping false negatives.6 However, uptake on bone scintigraphy indicates active disease, making it useful to clinicians, particularly when evaluating for treatment response. Osteomyelitis can affect any bone in any patient. Bone infection can have a wide range of radiographic presentations from a highly aggressive appearance with periosteal reaction, to a benign appearance with well-defined sclerotic margins.7 Osteomyelitis can appear expansile and may obliterate fat planes, invariably resulting in effusions or cartilage loss if the process involves a joint.7 A bony sequestrum is common in osteomyelitis. The benign appearance can be seen particularly when osteomyelitis is subacute or chronic, as well as with chronic recurrent multifocal osteomyelitis, an idiopathic inflammatory disorder primarily seen in the pediatric population.8 Osteomyelitis instigates an osteoblastic response and, therefore, demonstrates increased uptake on bone scan. Bone scan uptake can be seen up to 14 days prior to radiographic findings.9 A three-phase positive bone scan, meaning increased activity on dynamic flow, immediate static blood pool, and delayed static images, is 73% to 100% sensitive for osteomyelitis.10 A negative three-phase bone scan essentially excludes osteomyelitis. The patient was treated with curettage and grafting of the proximal femoral lesion with plating of the pathologic fracture. 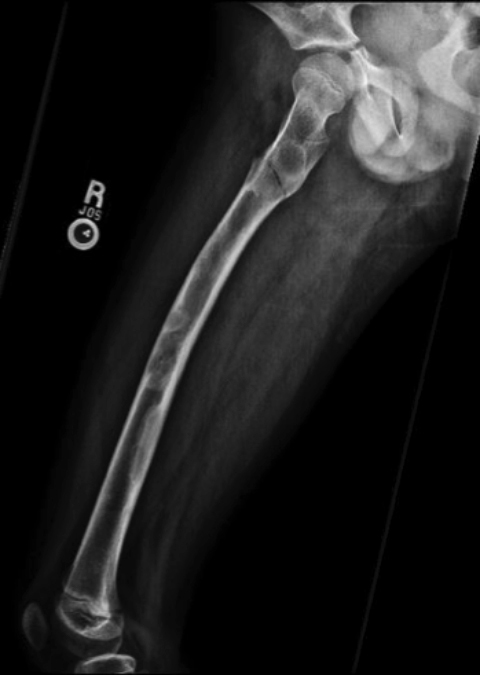 The entire femur was stabilized with intramedullary rods due to the presence of additional lesions. Histopathology confirmed a diagnosis of fibrous dysplasia. The patient was identified as having a G-protein defect, which is specific for McCune-Albright syndrome. Despite having polyostotic fibrous dysplasia and McCune-Albright specific G-protein defect, the diagnosis of McCune-Albright syndrome was deferred as the patient did not have laboratory or physical exam findings consistent with precocious puberty or café-au-lait spots, other components of the McCune-Albright syndrome. Nonaggressive-appearing bone lesions (well-defined margins, narrow zone of transition, lack of periosteal reaction) are often incidental findings in the pediatric population. These lesions are typically asymptomatic unless complicated by trauma/pathologic fracture, the other circumstance under which they are typically found. Radiography is the imaging modality most often used for initial evaluation. CT, MRI, and bone scintigraphy are also helpful for further characterization. Laboratory testing is useful if osteomyelitis is suspected or the process is polyostotic. Genetic testing may be indicated for the evaluation of polyostotic bone lesions secondary to syndromic etiologies. Levine SM, Lambaise RE, Petchprapa CN. Cortical lesions of the tibia: characteristic appearances at conventional radiography. Radiographics 2003;23:157-177. Fitzpatrick KA, Talijanovic MS, Speer DP, et al. Imaging findings of fibrous dysplasia with histopathology and intraoperative correlate. Am J Roentgenol 2004;182:1389-1398. Machida K, Makita K, Nishikawa J, et al. Scintographic manifestation of fibrous dysplasia. Clin Nucl Med 1986;11:426-429. Kilborn TN, The J, Goodman TR. Paediatric manifestations of Langerhans cell histiocytosis: a review of the clinical and radiological findings. Clin Radiol 2003;58:269-278. Azouz EM, Saigal G, Rodriguez MM, et al. Langerhans’ cell histiocytosis: pathology, imaging and treatment of skeletal involvement. Pediatr Radiol 2005;35(2):103-115. Blickman JG, van Die CC, de Rooy JWJ. Current imaging concepts in pediatric osteomyelitis. Eur Radiol Suppl 2004;14:L55-L64. Khanna G, Sato TS, Ferguson P. Imaging of chronic recurrent multifocal osteomyelitis. Radiographics 2009;29(4):1159-1177. Schauwecker DS. The scintigraphic diagnosis of osteomyelitis. Am J Roentgenol 1992;158(1):9-18. Pineda C, Vargas A, Rodriguez AZ. Imaging of osteomyelitis: current concepts. Infect Dis Clin North Am 2006;20(4):789-825. Campbell VA, Starsiak MD, Johnston MJ. Radiographically Benign-Appearing Lesion in Child with Uptake on Bone Scan . J Am Osteopath Coll Radiol. 2016;5(3):24-26. Victoria A. Campbell, M.D., Michael D. Starsiak, M.D., Mickaila J. Johnston, M.D. Drs. Campbell, Starsiak, and Johnston are with the Department of Radiology, Naval Medical Center San Diego, San Diego, CA.